Dustin Pedroia started the ninth inning off for the Sox with a double off the left field wall against closer - and eventual game loser - Sergio Santos. The pesky second base man also had a home run off Henderson Alvarez. 8:49 p.m. – Dinner at the in-laws and bath time for my daughter means I missed the opening ceremonies and the first inning. As a Red Sox fan, I’m fine with both of these occurrences. 9:03 p.m. – I picture Brett Lawrie doing everything aggressively in life. Like he springs out of bed in the morning and catches a hot coffee flung at him before his feet hit the ground. 9:07 p.m. – Good start for both young pitchers. 9:10 p.m. – While moving out of our old house on the weekend I found a trading card of Carlton Fisk (2 of diamonds). I assume this means Saltalamacchia will have a good game tonight. I realize this is terrible logic. 9:13 p.m. – Salty lines out on a great catch by Colby Rasmus. The Fisk mojo must come later. 9:16 p.m. – Break from the action to clean baby bottles, now watching game on MLB iPad app. I love technology. 9:30 p.m. – The switch from TV to radio/iPad app results in two Toronto runs, I hate technology. Red Sox lucky they only allowed two in the inning. Jays fans gave Rasmus a nice ovation for the triple. By my math he’s due for another hit next month. In all seriousness, Bruce Arthur of the National Post tweeted the Rasmus catch, hit and slide might be the best 10 minute sequence in the his young career. I have to agree, great baseball by Rasmus in that span. Jays lead 2-0. 9:42 p.m. – Yu Darvish got lit up for four runs by M’s in first. Needed to spread the misery around. 9:54 p.m. – 80 pitches through four innings for Doubront. It’s game four of the season and I’m already dreading the Red Sox bullpen and intently staring at pitch counts. 10:01 p.m. – Red Sox with runners on second and third, one out, Salty grounds out. No runs score. Fisk mojo still on hold. 10:03 p.m. – Aviles, you’re no Scutaro. Officially the saddest statement made by a Red Sox fan thus far this season. Red Sox strand both runners and still trail Jays 2-0. 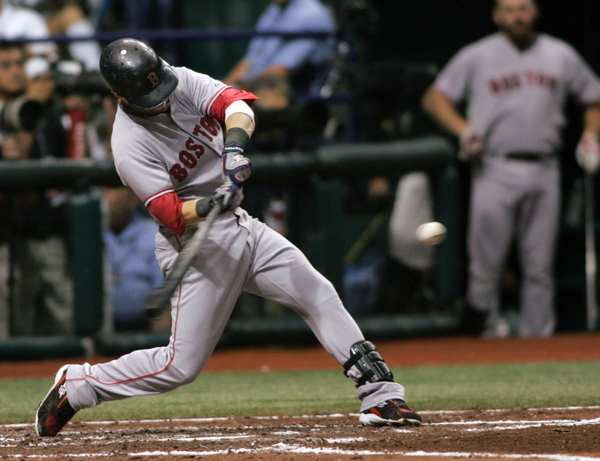 10:20 p.m. – Home run for Dustin Pedroia, sign of life for Boston. The Muddy Chicken strikes again. Jays lead 2-1. 10:24 p.m. – Jamie Campbell promos Brian Burke end of year press conference. That could have been done weeks ago. 10:29 p.m. – As rare as seeing Big Foot, Red Sox bullpen delivers three up three down inning. 10:38 p.m. – Why Bobby V. is Ortiz trying to steal? Brutal. 10:51 p.m. – Maybe Salty used Fisk mojo magic to get out of the way of Cordero’s pitch. 10:52 p.m. – Salty strikes out, I think finding that playing card meant nothing. This is sound logic. 10:53 p.m. – Great catch at first by Adam Lind, this isn’t Boston’s night. 10:59 p.m. – Played a couple quarters of NBA Jam on iPad to get winning feeling back. 11:00 p.m. – Three innings of scoreless ball from Red Sox pen, where was that in the third Tigers game. My daughter is in bed asleep, so is my wife. I should be asleep as well. I’m going to pay for this in the morning. 11:01 p.m. – Double by Pedroia to lead off the top of the ninth. Jays up 2-1. 11:03 p.m. – Pass ball, Pedroia to third. 11:05 p.m. – Nice block by Arencibia, Pedroia still at third. 11:06 p.m. – Pedroia scores on sac fly. Long live the Muddy Chicken. Game tied 2-2. 11:07 p.m. – No decision for Alvarez, too bad because he was great for the Jays. 11:08 p.m. – Youkilis hates being on base this season. Greek God of Walking Back to the Dugout. 11:09 p.m. – Aceves is up in the pen for Boston, Jays fans rejoice. 11:10 p.m. – Walk to Ortiz. 11:13 p.m. – Walk to Ross, Darnell McDonald pinch runs for Ortiz. 11:15 p.m. – Sweeney singles, McDonald scores. Red Sox lead 3-2. 11:16 p.m. – Is it time for Fisk mojo to work on Salty? 11:17 p.m. – Wild pitch, Ross scores. The play, a tough one for Arencibia, involved a catcher so I’m counting this as Fisk mojo. Red Sox lead 4-2. 11:19 p.m. – Salty walks. Enough of Santos, in comes Perez. Aviles retired, bring on Aceves. 11:25 p.m. – Things that make me less nervous than Aceves pitching the ninth include shaving with a straight razor for the first time, swimming with sharks and an open wound, there are others. 11:27 p.m. – Got to love Lawrie, he nearly beat out that grounder. One out. 11:29 p.m. – If Thames was in the Simpsons baseball episode, Burns would want those sideburns gone. Thames strikes out. Two down. 11:32 p.m. – Red Sox win first of the year, home opener ruined. I can go to sleep happy. Long live the Muddy Chicken and Fisk mojo. Hahaha some great lines here. It’s like I got to watch the game with you and enjoy all your witty comments without actually having to put up with you for three hours.